Tuesday morning we got up at 5am-ish to meet the bus at 6. We ate breakfast (first mistake) and headed up to the Reunion House to meet the bus to take us to our plane. There is a "Royal Terminal" at the airport. 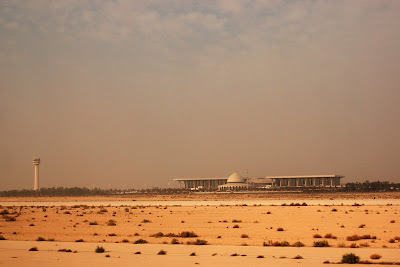 This is the view of it from the plane while we were taxiing from the Aramco Company terminal. This pictures looks straight out of the 70's to me! The reason eating breakfast was a mistake is because we then were served doughnuts in the airport (but not until all the women had to go through a special screening). Then we got breakfast on the plane - a 1 and a half hour plane ride! 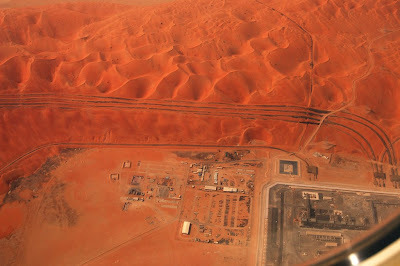 It was really interesting to see the landscape become the desert I had expected all along. If you click on this picture you can see the road running from the bottom right up through the middle of the picture (south). This road is something like 1200 kilometers long all through sand dunes. 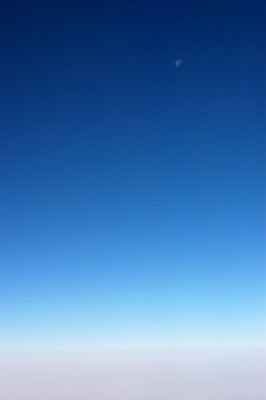 There is nothing else out here. 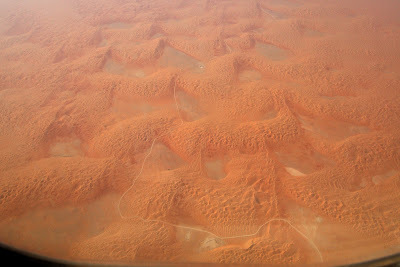 This is why it's called the "Empty Quarter" or Rub Al Khali. 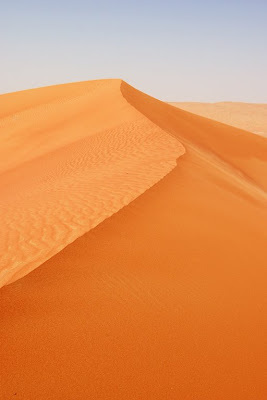 The "dents" between the dunes are called Subhas. They are flat spaces where the sand doesn't collect. Amazingly enough they don't change their locations so all of the facilities that were built in this area are built in the Subhas. Apparently the sand blows one direction in one season and then the opposite direction in the off season, leaving a net change of just a few inches a year. They studied this before building anything by comparing satellite images from the early 70's to ones from 2000. The black lines in the sand are the oil pipelines (underground) with oil poured on the surface to keep the sand from totally burying them. 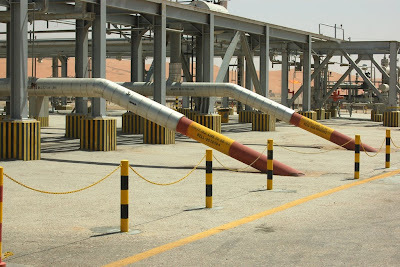 These lines are running into a GOSP (Gas Oil Separation Plant). There are 3 of these GOSPs in operation currently and a 4th one under construction - hopefully to open this summer I think. GOSP-2 is the main operation and the other ones are all controlled from a central control room there. There are a couple of people on-site in case anything goes wrong though since they are separated by about 20 kilometers each. This is a photo from still in the plane. 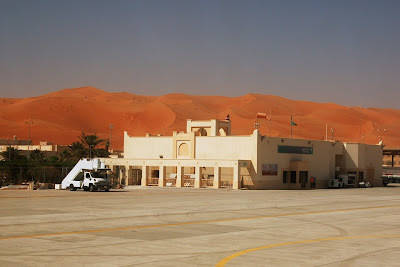 The building is the airport at Shaybah and behind it is one dune. I think they are about 900 feet tall on average. 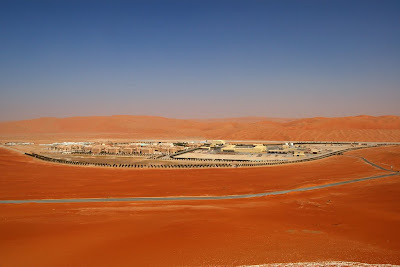 We drove up on top of the dune in the previous picture and this is looking back down on the living camp. You can see the (blue) tail of the plane right in the center of the picture to the back of all the buildings. There is space for 1,000 men to live here and the whole thing is self-sustaining. 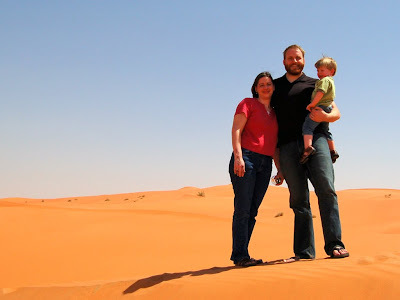 They can be locked in from planes due to sand storms and like I mentioned earlier it is 1200 kilometers (or about 12 hours) driving time through nothing to get here! At the top of the dune there is a "tent", which is more like a permanent structure to look like a tent, where they served us a "snack" and gave us a short presentation on Shaybah and all the logistics it took to create it. 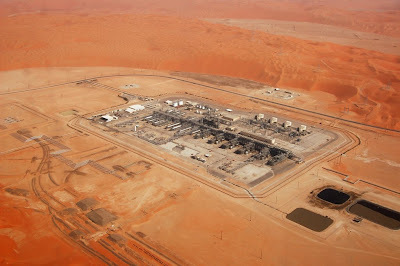 Shaybah is relatively new, having started construction in the early 2000's and obviously still under contstruction with GOSP-4 opening soon. Here they use horizontal wells, drilling down to the level of the oil reservoir (which is kind of like a spongy rock with oil trapped in it) and then drilling horizontally with branches off the main pipe to make the most of the level where the oil is. We got to take a guided tour with one of the top engineers/supervisors here and since Brian and I were sitting in the front... we asked a lot of geeky questions! Come to find out later that the people in the back of the bus (thanks father-in-law) could hear us talking as well! These are the pipes bringing the oil in from all the wells to the separation plant. 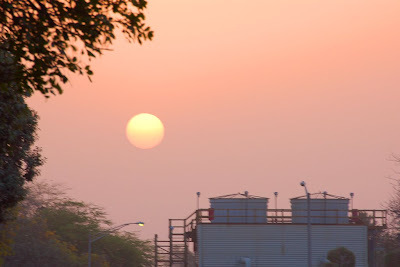 There are over 200 wells total in the area of Shaybah. These are the pipes that send the natural gas back down into the reservoir to help keep the pressure up. 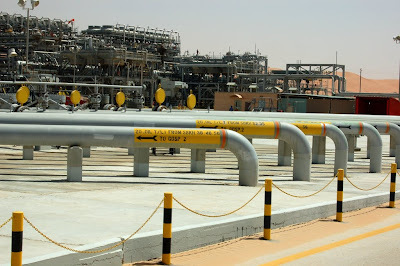 They will eventually use the natural gas as well, but for now they don't have a plant to process it and it helps the crude oil pump better if the pressure is high. Because really you don't "pump" oil out of the ground. It's kind of like a 2 liter bottle of soda that you have shaken. When you crack the seal the pressure starts to release. Putting a well down into the reservoir is like cracking the seal and the oil wants to come out because it is under so much pressure underground. This is GOSP-4, the one under construction. After our tour we went back up to the "tent" on top of the dune where they served us lunch at low tables! Totally fun, but we weren't that hungry due to all the food they had for us all the time! 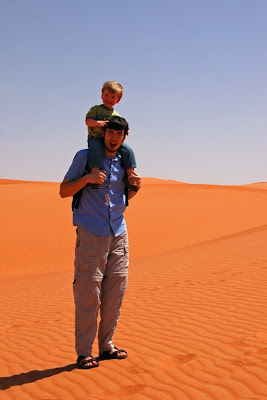 Then we had a very short amount of time to actually go and climb the bit of dune behind the tent. Due to the fact that we were climbing the dune at noon... the sand was really hot! And unfortunately I was wearing sandals that didn't keep the sand out so it was too hot between the bottom of my feet and the sandals. So I ended up taking them off, sprinting until I couldn't stand it and then burying my feet in the sand to cool them off a bit. I made it to the top and back, but my feet were pretty sore. Thank goodness for the water bottles that they gave us on the way back that I rested my feet on on the plane all the way home! You can't really tell, but we are actually standing on the top of the dune. It drops off behind us and then rises again to the ridge behind us. And yes, the sand really is this amazing red color. We collected a bottle of it as well as a bottle from Ras Tanura the day before and this one is red to the other's white (with sea shells!). On the way back we got... yet another "lunch" on the plane! This is Cory's favorite game. He's holding his foot up and asking me to "smell-o toes". When I react with the face below and "pe-ew stinky" he thinks it's hilarious. It's an amusing game that keeps him occupied for as long as we're willing to play it! 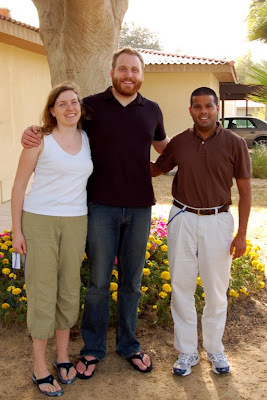 The other cool part about this trip was that Brian and Allison got to see a guy that they grew up with. His name is Ian (pronounced like yawn) and he's from Goa. Now he lives in New Jersey. 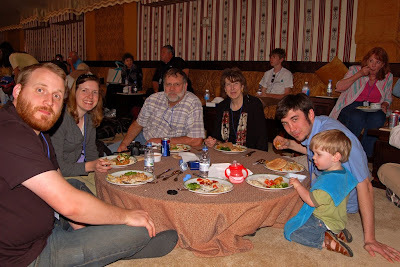 We got back from this day at about 3 in the afternoon... and still had a "Farewell Dinner" to attend that night! But I'll leave that for next time. Do you plan on ever going back if there is another reunion? I LOVE that picture with the road going through it. How cool is that! Of course, it would not be cool to break down in the middle of it. I am still very envious of your trip and am having a good time reading about it. Question: Hmmm..did you gain weight during your stay there? Because I know how they serve the guests!! Talk about quantity! Your expression on the feet smelling session with Cory is too funny! BTW, I like the dune pictures. hi. i enjoyed reading your blog. 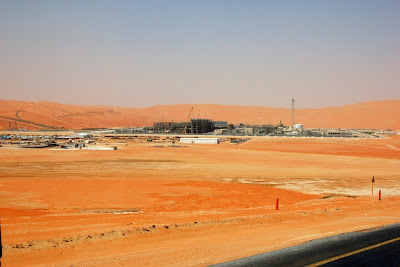 i am actually working now in Shaybah expansion project. Cool to see some of your pictures. I have the same photos but actually scared to post because I am thinking it is disallowed. i'm surely gonna write about my experience and will post some pics too.